Every five minutes, someone buys a copy of Amnesia: The Dark Descent. 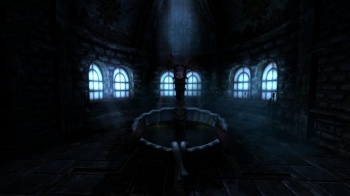 Amnesia: The Dark Descent was a breath of fresh air for survival horror fans. Described as "the horror game equivalent of Super Mario" by developer Thomas Grip, the game struck an amazing balance between immersing players into its bleak and horrifying world, while carefully providing the skills needed to complete the game without overwhelming the player. Being able to frighten gamers without caving in and adding features like regenerating health not only made the game a success, but also a consistent success; Grip has revealed that the game continues to sell well two years after release, selling approximately a million copies in total. "Without counting the units bought [through the Humble and Potato Bundles] our total lands at 710,000 units," Grip wrote on the Frictional Games blog. "Adding all HIB and Potato Sack sales gets us to 1,360,000 units in total, which can be called the optimistic figure ... A slightly pessimistic guess (not far from reality I think) is that 2/3 of every bundle and pack buyer already owned Amnesia. This gives us about 920,000 units in total." What's really fascinating about Amnesia sales is that outside of obvious peaks during the game's initial release and later Indie Bundles, the figures remain consistent on a monthly basis. "Not counting any discounts, the monthly full price sales lie at over 10,000 units. This means that less then every 5th minute someone in the world is buying a copy of Amnesia ... The figures themselves are far beyond any guesses we would have made two years ago. It is also insane, because this number is actually higher than it was around three months after initial launch." Interestingly, Frictional's other horror series Penumbra also continues to sell 900 units per month, which alongside Amnesia should make 2012 Frictional's most profitable year. Grip speculates that Amnesia's continued success is simply because so few developers are making anything like it, and he may have a point. The only recent contenders that come to my mind are Lone Survivor and an Amnesia sequel Frictional Games is producing. Another factor is that Amnesia actually has a surprisingly large modding community; Amnesia is currently the second most popular game on ModDB, having with over 170 finished projects. It's a good thing we have those mods too; Grip also mentioned that the Amnesia sequel won't be out until 2013.